• How big will the images look on my walls? BY APPOINTMENT ONLY. CALL (604) 985-4262 TO ARRANGE AN APPOINTMENT TO VISIT MY HOME STUDIO GALLERY. This gallery has by far the best selection of Tony Max prints, because it's my home studio. By appointment only. I carry the world's largest selection of Tony Max art for sale, and to maintain quality and value, I am the exclusive, worldwide publisher and printer of my art prints. My phone number is (604) 985-4262. To write to me, click on the Tony Max logo below. I welcome customers to view my art at my home studio. Phone 604-985-4262 for an appointment. View a bigger, interactive map on the Internet. Usually one to five weeks for canvas prints – unless I have the print(s) you want in stock. If you're in a hurry, I can often hasten print production when asked to do so. Making giclees (high-end, fine art inkjet prints) is a laborious process. Normally I print prints in batches to increase efficiency. I normally print a batch of prints about every four weeks – waiting each time till I get enough print orders to make it worthwhile to print. The printer's nozzles need to be checked for clogging before each printing, and the nozzles need to be unclogged if they're clogged, which requires extra time and ink used for the cleaning cycles. This makes it inefficient to print only one or two prints at time. The same applies to varnishing. There's a considerable amount of preparation for varnishing and clean-up after varnishing, so it's inefficient to set up my studio and clean up just for one print or a few prints. I also normally order stretcher bars in batches, also to increase efficiency and to take get free shipping from my stretcher bar manufacturer. I supply stretched canvas prints for local galleries in Vancouver, as well as for customers who come to my studio here to pick up orders. It's because of these efficient processes that I'm able to pass on my savings to my customers and have the low prices that I have. By being efficient with production, I'm also able to produce more art, which also pleases my customers, as it increases the variety of art images that I have available for viewing and sale. If you're in a hurry for a print order, contact me to find out where in my production cycle I am, and if I can expedite your order. For those in a hurry and with a bigger budget, I can also expedite production if you're willing to pay the rush fee. How big will the images look on my walls? It can be difficult to estimate how big or small particular pictures will look for your walls, so I've provided some example photos of my prints of differing sizes hanging on walls. "Quadra Island" – 21 by 56 inches. (One and three-quarters feet high by four and two-thirds feet long). "Kits – Backlit Trees" – 21 by 25 inches. • Email by clicking on the Tony Max logo directly above to find out if I can recommend a gallery or galleries that have the print(s) in stock that you're interested in. 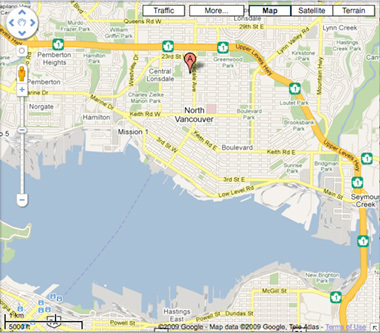 • Phone (604) 985-4262 to arrange for an appointment with me at my studio in North Vancouver (see map). For shipments to areas outside of southwestern British Columbia and countries other than Canada, please email regarding shipping charges. I ship my unstretched canvas prints rolled in a mailing tube. I don't sell my pictures framed, because I'm an artist – not a picture framer. For framing of my art, you can take my art to a picture framer.